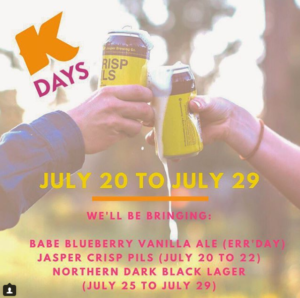 For the first time ever, K-Days in Edmonton, AB has an all craft beer policy. You’ll be seeing lots of great Alberta breweries featured such as Jasper Brewing Company and Wood Buffalo Brewing Company, care of Albeerta Provisions. You can also grab a pint of a wide selection of craft beers at the Well Crafted – Liquor on McLeod bar, inside K-Days at Hall G. To compliment this selection, samplings will be held throughout the week. Albeerta Provisions will be providing their second round of samples on Friday, July 27th from 4-6 pm, and Saturday, July 28th from 6:15-8:15 pm. Previous PostThe Mashing in Edmonton and Calgary, chances to win! Next PostLast Best at Stampede Park!